My grandfather, Herman Wilensky, came to New York from Leningrad in 1901 and began by working in New York as an apprentice in the sweatshops. He had the unfortunate experience of meeting someone in Liverpool who took his money for a ticket and then disappeared. He worked a year, saved his money again and bought another ticket to New York. I believe he was in his late teens when he came to New York. His ship’s record indicates that he sailed from Hamburg and arrived at the Port of New York in May of 1900. He sailed on the Auguste Victoria. He had $5.00 in cash and was going to be staying with a Lewis Wilensky. Many people who were working in the sweatshops at that time did come down with consumption (Tuberculosis). Herman was afraid of contracting the disease and so when the opportunity to move west came his way, he left for North Dakota. He appears to have come alone. He filed his naturalization papers in North Dakota on December 3, 1909. 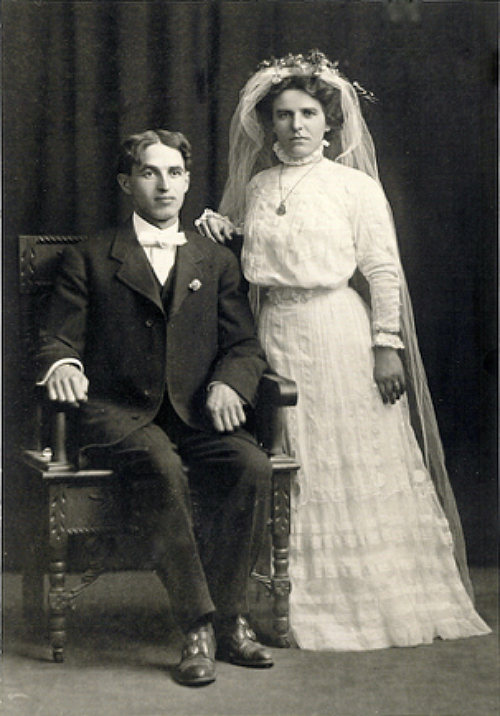 Later, two of his brothers, Joe and Isadore, also came to North Dakota for a short time. 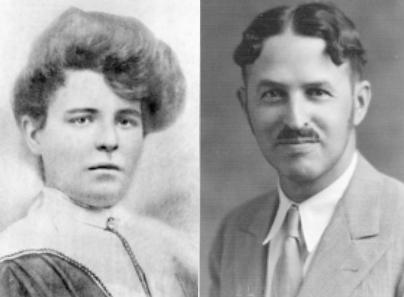 Isadore filled his Declaration of Intention on April 8, 1918 and Joe filled his Declaration on Intention on December 3, 1912, both in North Dakota. Herman’s first job was selling suits. He took measurements, sent all the information to New York where the suits were made up. This was not successful so he went to work on the farms. At first he got a job on Davis Rubin’s farm helping with the harvesting. There was a second free land grant program taking place in North Dakota at this time, 1905. Herman was given a land grant at Tyoga near Williston. Plans to marry my grandmother, Ida, were already in the making. He worked the land during the summer and returned to the Rubin farm during the winter. After five years, he sold the land and moved to Devils Lake where he opened a tailor shop of his own. Unfortunately, he also sold the mineral rights on his homestead property, and later oil was discovered there, but it was too late. At first Ida had a millinery, the business of making or selling women’s hats. Later she expanded her business to ladies’ wear. 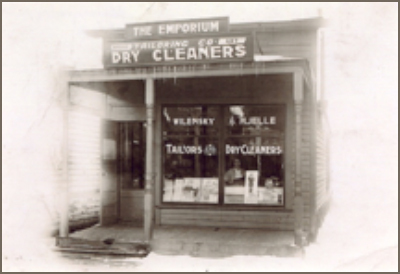 Herman’s tailor shop moved to the back and Ida’s goods were sold in the front of the store. Ida is pictured in the window of the store in this photo on the right. The family lived in four different houses in Devils Lake. The first three were rented and the last was purchased. The first house was on Second Street next to the Greenhouse. The house was on the next block from Bessie and Davis Rubin’s house and also near Davis’ furniture store. They were living there when Bessie died. The children spent a lot of time in the home of the grandparents. The second house was a three-bedroom home on Arnold Street and the third house was a nice big one on Fifth Street with lots of bedrooms. The last house and the only one they owned was on Kelly Avenue. The Kelly house was distinguished by its almost total lack of closets, with four daughters that must have been quite a trick. The house had running water, but it couldn’t be used for drinking. One of Sidney’s chores was to bring the drinking water from the pump on a nearby corner or from the Kesslers, the neighbors across the street, who had a good artesian well, or from the courthouse. Grandpa Rubin lived with the family after his divorce. On Saturday evenings he would settle into the bathroom for his weekly bath, which would take four hours. It was unfortunate if anyone needed to use the bathroom during this ritual. Such an event would necessitate a visit to one of the neighbors. Rain water was collected in a cistern and used for hair washing. The family also had a boarder, named Mrs. Prosser. She had a very successful son who was a Broadway producer. The family had some connection to Ida. Mrs. Prosser had rented a room in the previous house, so when they moved, she moved with them. Mrs. Prosser did not eat her meals with the family. When she could no longer live alone, her son came for her. He found under her bed all of the gorgeous gifts of clothing that he had sent her, but she had never worn. Boarders were very common. All the Wilensky girls shared one bedroom and one closet. Max built the only closet in the room. The design of the house was such that Mrs. Prosser had to walk through the room that Sid and Zadie Rubin shared in order to get to her room. The house had a big kitchen and a big round table. As was common for the times, there was an icebox with ice delivered by the iceman, a coal furnace with a coal shoot for shoveling the coal, a milkman who put the milk directly into the refrigerator and of course, no one ever locked the door.